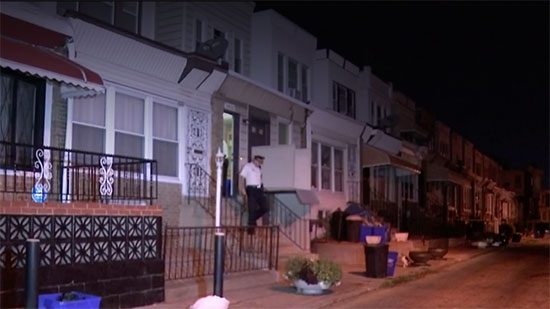 Two women were wounded when shots were fired at their South Philadelphia home early Friday morning. It happened around 2 a.m. on the 5400 block of Hatfield Street in the Kingsessing neighborhood. A 36-year-old woman was visiting her 40-year-old friend when they heard loud banging at the door. One of the women went to look through the peephole. That's when someone opened fire from across the street. 14 shots were fired into the front of the home. Each woman was struck once. The 40-year-old was hit in the stomach and the 36-year-old was hit in the leg. Both were taken to Penn Presbyterian Medical Center in stable condition. A 3-year-old girl was also in the home, but she was not harmed. The women say the shooter flee the scene wearing a mask. Investigators are trying to determine a motive. Philadelphia Police are investigating after the attempted abduction of a 10-year-old girl in the city's Frankford section. It happened after 8:30 a.m. on the 5300 block of Gillespie Street. Officials say that a man grabbed the girl by her collar and tried to drag her into his car. The girl was able to break free and run away. She was then taken to her school. The suspect is described as a white man, 30 to 40 years old, with green eyes. He was last seen wearing a black shirt, blue jeans and black boots. He was driving a black vehicle. If you have any information you are asked to contact police. The Special Victims Unit is handling the case. UPDATE: Philadelphia are now investigating 4 similar luring incidents (3 this morning, 1 yesterday) in the Frankford neighborhood. All seem to involve a similar male suspect in his 30's with a black car approaching 10-year-old girls. Philadelphia Police raided and shutdown a massage parlor near Rittenhouse Square on Thursday evening. The business is located on the 1800 block of Ranstead Street. Three women were taken into custody and face prostitution charges. Neighbors have complained about the location saying men frequent all hours of the day and night and sometimes there is even a line out front. Officers also seized computers and other evidence. A "cease operations order" was placed on the front door. Tropical Storm José's forecast track has shifted more towards the west. It is expected to regain hurricane strength and make it's way up the East Coast next week. The storm will stay off shore but will impact beaches with heavy surf.